Belonging to the same family as the Mountain Nyala, the Bushbuck shares with them the family characteristic of shy and elusive behavior. 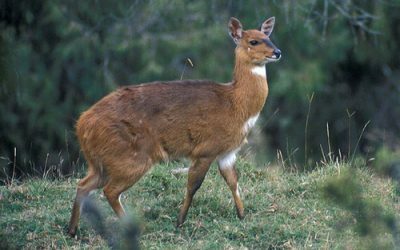 Over forty races of Bushbuck have been identified, which vary considerably both from the point of view of coloration and from the type of habitat they frequent. Most of them are forest living animals inhabiting dense bush, usually near water, though this is not an essential, as some of them have been known to go without drinking for long periods when necessary. No accurate estimate has been made of their total population because of their nocturnal and furtive habits. Like the Mountain Nyala, they are easier to observe in the Bale Mountains National Park where they are fully protected and therefore a little less shy.